For individuals managing sarcoidosis, or many other chronic conditions, it can be extremely beneficial to pay close attention to nutrition. 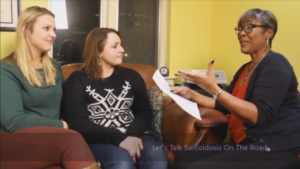 Klara Knezevic, RD, LD and I appeared on the very first episode of Let’s Talk Sarcoidosis: On the Road. We invited host Dorothea McGuire into our Greenbelt office to see firsthand what it is like to visit us at Rebecca Bitzer & Associates. We took Dorothea on a tour of our office, and discussed some of our programs like Mayhem to Mealtime. We talked about what it’s like to meet with a Registered Dietitian, what we can do for individuals trying to manage chronic conditions. After the small talk, we got down to business! Klara, Dorothea, and I whipped up a delicious beef stew featuring spices that help with inflammation, right in our office! We paired this easy stew with this delicious turmeric rice. We couldn’t forget dessert, so we made warm cinnamon apples with a crunchy almond topping. So tasty! 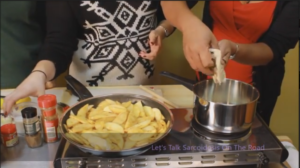 If you’re wondering what it’s like to come see us at Rebecca Bitzer & Associates or what a Registered Dietitian can do for you, check out this episode of Let’s Talk Sarcoidosis: On the Road! 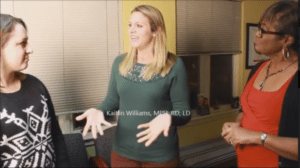 If you are interested in meeting with one of our Registered Dietitians, please click here or call (301) 474-2499 to make an appointment today!